My usual Egg and Dill Tea Sandwiches call for chopped hard-cooked eggs, but I have one friend who has an aversion to chopped egg salad of any kind but likes sliced hard-cooked eggs. We all have our little quirks and, after all, she is pregnant; so I will indulge her. Her mother-in-law and I are having a small afternoon tea where she will make the boy-or-girl announcement after her next ultrasound. It's always a good idea to give a new tea sandwich a trial run before its official debut, so I experimented a bit yesterday and came up with these Sliced Egg and Dill Tea Sandwiches. They'll be perfect for the tea party next month. We'll also be making my famous Cucumber Sandwiches. Of course, the most important part of an afternoon tea party is a proper cup of tea. And here is How to Make a Proper Cup of Tea! If the guest list expands at all, I'll use my Zojirushi Water Boiler instead of a kettle. *Such as Arnold/Brownberry/Oroweat country buttermilk bread that comes in the wider 1 1/2-pound loaves. Or the dill rye! If you use smaller bread slices (as I do when I have my homemade Classic White Sandwich Bread on hand), make more full-sized sandwiches to come up with about the same quantity of tea sandwiches. 1 Place eggs in a single layer in pan. Add enough room temperature water to cover eggs completely and an inch over. Bring to a boil over high heat. As soon as water is bubbling lightly, remove pan from the heat and cover tightly with the lid. Let stand for 15 minutes. Drain and add cold water to pan; repeat twice. Leave eggs to cool for 15 minutes in cold water. Drain, and proceed with recipe or refrigerate until ready to use. 2 In small bowl, whisk together mayonnaise and mustard. Measure dill into a tiny bowl. Lay out bread slices and divide mayonnaise mixture among them; spread evenly, skipping the edges and round part at the top because they are going to be cut away. 3 Using an egg slicer, slice each egg into rounds. Place about 6 rounds from the middle of each egg close together on the bottom slices of bread. Use pieces of remaining slices to fill in the spaces between the round egg slices. 4 Pinching the dill between thumb and first two fingers, sprinkle the measured amount evenly over the 7 sandwiches, then sprinkle with just a little salt and as much black pepper as you like. Put top bread slices in place. Trim off crusts and cut each sandwich into 4, arranging on a plate in about 3 layers. 5 Lay a high-quality white paper towel on top of the sandwiches. Wet and wring out well another paper towel; lay the damp paper towel on top of the dry paper towel. (Placing the damp paper towel directly on top of the sandwiches would result in soggy sandwiches.) Wrap snugly with plastic wrap; refrigerate for at least an hour or up to several hours. This makes the sandwiches “hold together” and keeps them from drying out. Uncover sandwiches just before serving. Oooohhh..these sound good... chopped or sliced, I love a good hard boiled egg.. and dill goes so well with egg, doesn't it? Thanks, Jenn! I think dill is my favorite herb. I have never tried dill in egg salad...it sounds like a great flavour combination. These sandwiches look so good! Angie, thank you. It's also good with just a tiny bit of curry powder. These looks so very British; you do tea and scones and sandwiches SO much better than we do in the States. I grew up with baloney or peanut butter and jelly. Time to expand my sandwich horizons! Thanks so much, Melissa! Eventually, I'll post more of my tea sandwiches so you can further "expand [your] sandwich horizons" -- I like how you put that! Jean-leave it to you to be so considerate of your friend's special needs. When I was pregnant I went on 'the white--no lumps diet. I could eat potatoes (smooth, no lumps), cottage cheese, scrambled eggs, and white bread. Any hint of chunks and it just wouldn't go down. 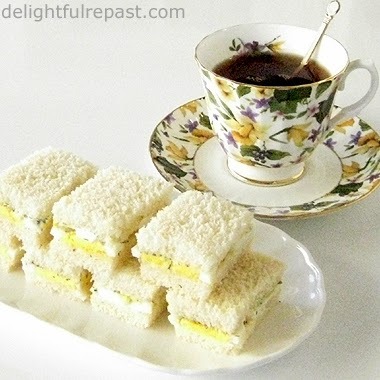 These Egg sandwiches look like they would have fit just fine in that special time and look tasty now. 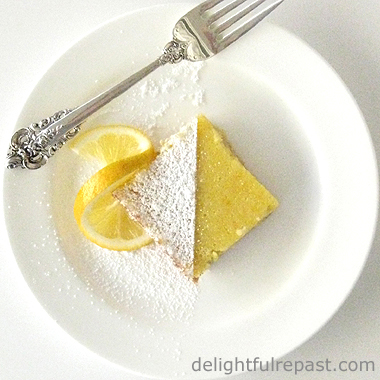 I have to say I've made your classic scones many times since you posted the recipe! For a person who doesn't like scones, these are delicious. Hubby really liked them. Aawww! Thanks, Sue. I'm thinking about 1/8 to 1/4 teaspoon curry powder mixed in with the mayonnaise mixture might be good, too. But I thought I better keep it pretty plain for the pregnant lady. YOUR pregnancy diet sounds like a hoot! I'm so glad you and Hubby are enjoying my scones! Beautiful picture and the sandwiches sound so tasty! Thank you, Mildred! Wish I had a couple of them right this minute! Jean, good of you to accommodate the guest of honor. Moreover, the paper towel technique to keep the sandwiches fresh is one I may not have considered - nice tip! Thanks, Brooks! Yep, after all these years I've pretty much worked all the kinks out of tea sandwiches! I gotta admit that sliced eggs in sandwiches drive me nuts. I end up biting a bit of the white off which doesn't quite detach and the hooks onto the round of yolk inside and whips it out so it falls all over my clothes. I'd have to mush them up with a bit of a binder like mayo just for the sake of keeping my clothes clean I think, but they look and sound great! Alas, I’m so ashamed. While I find it highly unlikely that I’m pregnant, I not only share the aforementioned aversions in your latest column, I extend them. Call me a Tea-totaller, i.e. totally don’t drink the stuff. Tried one time and antlers sprang out of my head, monkeys came out of my nose, and my tongue burst into flames. You think maybe I should’ve let it cool first? In any case, I hope you enjoy your tea. I will commiserate with a peanut butter cookie dipped in Coca-Cola. Or something. Sully, I still can't quite believe that *I* couldn't change your mind about tea if I could just have you here for one day! That said, I must admit I am not averse to the occasional cola! Jean, your egg tea sandwiches sound delightful. I have never sliced the egg for a sandwich but it's a different way to make them and I'm all for trying something different. Thanks for sharing and joining my tea party. Have a lovely day. Sandi, thank you so much! And thank you for the follow. I look forward to your next tea party! Maya, thank you! My tea party guests always like them. Having one this afternoon! Egg & Dill are always a staple at our house...for tea with company or just...well, just 'cuz! This is a great version! Thanks for linking to Tuesday Cuppa Tea! Ruth, I like that -- "just 'cuz!"